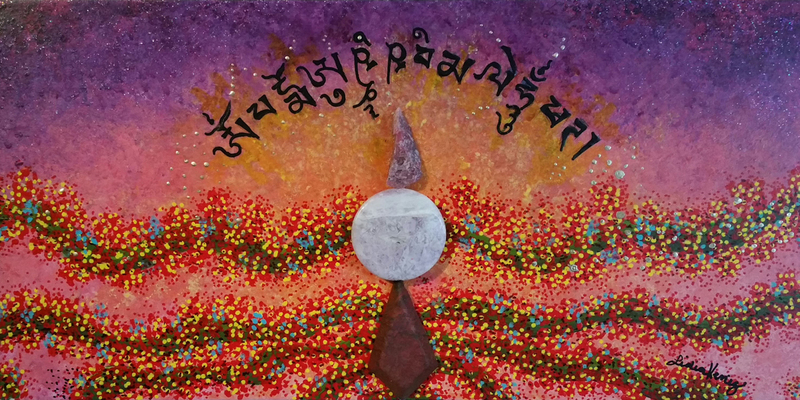 The powerful Wish Granting Jewel mantra is chanted and written on all door protectors, and is surrounded by personalized pictorial symbols. While this original is sold, canvas wrapped, blessed, embellished and ready to hang prints are available for purchase. Paper prints are also available but are not embellished and must be framed. In either case, I will forward installation instructions after purchase. Either prints format tend to be useful for immediate healing needs or life situations that resolve themselves in the best way possible in the short term. Originals work on deeper issues, long term situations and past karma. Please check out the information available in the Purchase Info menu, and contact me to inquire about ordering your personalized Door Protector or obtaining a Gift Certificate. Prints make great gifts!